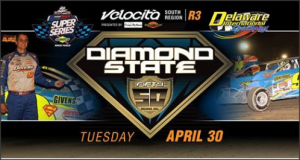 53 – May 24, 2018 – Delaware International Speedway/Delmar, Del. – Diamond State 50 (South, 50 laps): MATT SHEPPARD – Ryan Watt – Ryan Godown – Craig Von Dohren – David Van Horn Jr.
50 – March 17, 2018 – Georgetown Speedway/Georgetown, Del. – Melvin L. Joseph Memorial (South, 49 laps): RYAN WATT – Matt Sheppard – David Van Horn Jr. – Billy Decker – Billy Pauch Jr.
47 – October 7, 2017 – Afton Motorsports Park/Afton, N.Y. – American Racer Cup Short Track SuperNationals 10 (North, 50 laps): RUSTY SMITH – Andy Bachetti – Mike Gular – Mike Ricci – Rich Ricci Jr.
46 – September 30, 2017 – Bridgeport Speedway/Bridgeport, N.J. – Dirty Jersey 5 (South, 40 laps): RYAN WATT – Craig Von Dohren – Sammy Martz – Ryan Godown – David Van Horn Jr.
34 – March 11, 2017 – Georgetown Speedway/Georgetown, Del. Melvin L. Joseph Memorial (South, 49 laps): JIMMY HORTON – Ryan Watt – Billy Pauch Sr. – Duane Howard – David Van Horn Jr.
23 – May 26, 2016 – Delaware International Speedway/Delmar, Del. Diamond State 50 (South, 50 laps): STEWART FRIESEN – Duane Howard – Craig Von Dohren – Ryan Watt – Billy Pauch Jr.
13 – July 22, 2015 – I-88 Speedway/Afton, N.Y. Crazy 8s Special (North, 48 laps): STEWART FRIESEN – Andy Bachetti – Jeff Heotzler – Danny Creeden – Jerry Higbie Jr.
11 – June 11, 2015 – New Egypt Speedway/New Egypt, N.J. Dirty Jersey 3 (South, 40 laps): DANNY CREEDEN – Ryan Godown – Anthony Perrego – Ryan Watt – Billy Pauch Jr.
4 – August 6, 2014 – Accord Speedway/Accord, N.Y. Battle of the Bullring 2 (52 laps): ANTHONY PERREGO – Tommy Meier – Mike Ricci – Rich Ricci Jr. – Jerry Higbie Jr.